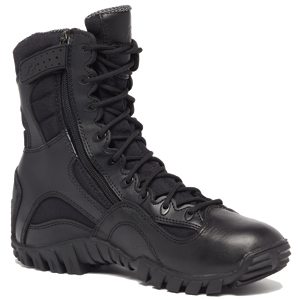 The Tactical Research TR960Z Khyber Zipper Hybrid Boot is a lightweight hybrid boot designed for military, tactical users, and law enforcement looking for high performance, comfort, and durability. A convenient side zipper saves time for those on the go. This boot features a contoured footbed for a low-profile fit and feel which increases agility and stealth. The upper is constructed of 100% cowhide smooth leather and abrasion resistant nylon. Aggressive lugs aid in quick direction turns, crawling, and rope rappelling. Air mesh ensures your feet are kept cool all day long. A moisture wicking lining brings eliminates wet and sweaty feet even after extended wear. The TR-1 insole provides an orthotic fit with extra padding to reduce shock on your ankles and knees. The TR960Z is built tough to maximize your performance while providing first class comfort that will keep you always ready for your next mission. I replace boots after about a year and a half. I'm pretty rough on my gear. These boots have held together well for almost 2 years. The only thing is the laces are frayed but not a big deal. The stitching on the boots has held together well and the leather is in good shape. The heel in the rear is showing some wear on both sides. I should be able to get a good 6 months to another year out of these. Very good compared to other boots in the sub $150 price range in my opinion. Also sizing is comparable to running shoes. These boots are comfortable. I recommend to any one that is in law enforcement or security. The boots fit very well and I like the tactical appearance. I've already had two people ask where I got these because they like the look. They are very comfortable and supportive. Just be aware they don't have air vents on the sides. I was very happy with these boots but after a month , one of the eyelets came out of the fabric. I had to send them back to Belleville to get a replacement but it wasn't a big deal. They were good about it. Been wearing the second pair for about 6-7 months now with no problems. Excellent duty boot. I get a lot of compliments on them. Maybe quality control could be improved.